Bike riding in Mammoth is fantastic. From the exhilaration of coasting down a scenic mountain road after pumping all the way to the top, there is mile after mile on uncrowded paved back roads, such as Benton Crossing Road, Round Valley Loop or Bishop's Owens Valley floor. Relax on your touring bike over the flat and rolling terrain of Bishop or climb a lung-busting hill on the ride to Mammoth and June along U.S. 395. Mix the clean mountain air and the awesome sights, and you get one great afternoon. Not into the grind of the hills? There are several scenic loops where you can put in your miles. Our local bike shops will have some great maps so you can check out the back roads. If you want some small peaks and valleys Bishop is a much easier ride than around Mammoth. Local rides around Mammoth will pound your quads, and mixed with the altitude give you one of the best high Sierra workouts. Several paved roads off Hwy. 395 provide smooth riding for the touring bike rider. You can go for hours cruising along the quiet winding roads, enjoying majestic mountain scenery all around you. If you find smooth riding to easy, get out and go mountain biking in Mammoth and try the backcountry or venture over to the Mammoth Mountain Bike Park. (By The Green Church) This is a pleasant and fairly easy ride for early morning or evening. The road is usually clear, and the views are spectacular. This is a nice wintertime ride too. And if you get tired or lazy you can stop at the hot tubs. Park at the green church at HWY 395 and Benton Crossing Road, then ride east as far as you want to. The first ten miles are almost flat, so this is a good speed training ride. If you don't want to continue on, there is no loop so turn around and come back but enjoy the different view. The really adventurous riding a mountain bike could take one of several dirt roads to the right and circle Crowley Lake back to Gorge Road, and back to HWY 395, or ride all the way to Bishop along a dirt road. This would be a long day. You can ride this road all the way to Nevada if you want to. is 1.2 miles and is recommended for beginners. Horseshoe Lake is located at the end of Lake Mary Road and the trailhead can be found at the campground area. As you loop around the perimeter of the lake, you will enjoy spectacular panoramic views of snow-capped backcountry peaks. Several bridges, cross-inlets and the dense forest offer good shade with the trail being mostly flat terrain on a firm surface. Drive up to Horseshoe Lake and park. Ride down Lake Mary Road, on and on and on and on into town. You can go all the way to the Sheriff's substation along highway 395 without touching the pedals. It is about eight miles of easy downhill. If you're ambitious, pedal uphill back to your car, that makes the ride 16 miles roundtrip. near June Lake Junction is for the intermediate rider and provides grand views of Mono Lake. 10.5 miles of grated dirt roads; this route consists of three consecutive loops. The vistas overlook the Mono Craters, which exhibit some of the most exemplary volcanic phenomena in the area. has a partially constructed hiking/bike trail that starts at the park and goes around town. The path starts across the street from the Stove restaurant. Pick up the paved trail next to the bridge over Mammoth Creek and ride downhill into Sierra Meadows. It is a mile ride, not very long, but is very scenic. There is a rest area with a picnic bench near the bottom. It is a moderate uphill back to the parking lot at Mammoth Creek. Ride up from town along Minaret Road to the Scenic Loop, then another 8 miles to HWY 395. It is rolling moderate terrain with a 500' gain and loss. Then you can ride back along HWY 395 to make a loop, or just ride the Scenic Loop back. The loop begins at the intersection of Hwy. 395 and Hwy. 158 It's a moderate 25 mile round trip with a 900' elevation gain. Begin at the intersection and ride the loop all around passing the four lakes on the loop. When you hit the north end, ride along Hwy. 395 heading south till you hit the intersection again. This is a hard ride, but worth it. If you can do it, you should be an ironman. It is about 25 miles round trip with elevation gain and loss you wouldn't believe. It is also a fantastic ride with fantastic views. During the summer a shuttle operates between the Mountain and Reds Meadow, cutting down the number of cars on the road. To do it right, begin at Grumpy's in town. Ride up to Mammoth Mountain, up to Minaret Summit, and down, down, down to Red's Meadow Resort. Take a break. Now work your quads as you ride back up to Minaret Summit, then down back to Grumpy's. Now have a beer and tell your stories. Some like to just start at Minaret Summit and take the downhill into town. No beer is you don't do the uphill! About 12 miles round trip from town. This is a really nice Mammoth ride. You get to see a variety of different flora and fauna, from forest to desert. Probably best done when it isn't too hot, and earlier in the day before the wind comes up. The ride to Hot Creek is almost all downhill or flat. Ride down HWY 203 to HWY 395, and then go south on the highway to the Hot Creek turnoff and ride on past the fish hatchery on the paved turning to dirt road. You can stop here if your tires won't handle the rocky road. A nice alternative is to ride out old Mammoth Road to the dirt road through Sherwin Meadows, following it down to HWY 395, then south on the HWY for a short distance to the Hot Creek turnoff. The road through Sherwin Meadows begins just past the bridge over Mammoth Creek on Old Mammoth Road. Turn left and go past the Sierra Meadows Horse ranch and follow that road to the HWY. 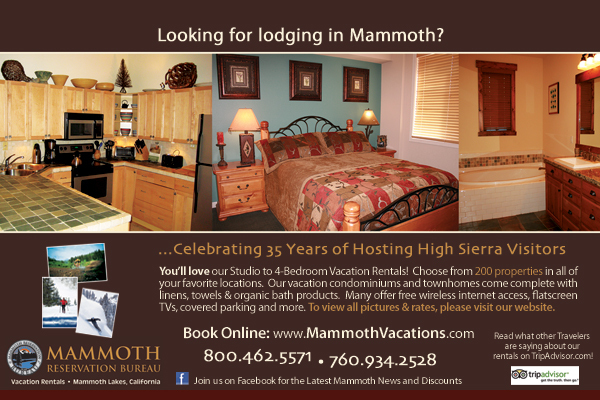 This is a classic Mammoth ride. This is a nice moderate ride up a continual grade. Starting from anywhere in town or near Tamarack Lodge. Get a rhythm and ride up to the lakes. It is all downhill coming back. About seven or eight miles round trip depending on which lakes you circle. You can circle Horseshoe Lake at the top if you are on a mountain bike, also ride up to Woods Lodge, circle Lake Mary, and have lunch at Tamarack Lodge, Lake Mary Store, or Pokenobe Lodge. An alternative is to drive up to Lake Mary, park, and ride around, but this cuts out most of the uphill. This is a moderate ride with downhill and a few serious uphill climbs. From Mammoth ride down HWY 203 to HWY 395, go south a few miles to the Crowley Lake Drive turnoff on the right. Ride through Crowley Lake, to Tom's place. South of the Crowley Lake town is one of the uphill stretches. At Tom's place get back on HWY 395 for a mile or so to the Lower Rock Creek turnoff. Follow that road all the way to Bishop, through Round Valley. It is about 35 miles one-way. Remember when riding "Altitude, not Attitude!" Be kind to nature and humans.